• On Saturday, Chilean artist collective Casagrande, along with Literaturwerkstatt Berlin, dropped 100,000 poems over Berlin as a protest against war. • This is the fifth instance of the “Poetry Rain” project, which has also taken place in four other cities that were subject to intense aerial bombings during their history. BERLIN: Last Saturday night, just as the sun was setting in Berlin, 100,000 bookmarks featuring poems by 80 Chilean and German poets rained from the sky. The event was co-organized by the Chilean artist collective Casagrande, which launched the “Poetry Rain” project in 2001 as a protest against war and a gesture supporting forgiveness. Over the last nine years, the group has held similar events in four other cities that were subject to intense aerial bombings at some point in their history — Santiago de Chile (2001), Dubrovnik (2002), Guernica (2004), Warsaw (2009). Casagrande teamed up with the Literaturwerkstatt Berlin for their latest event, which was held in the context of the Lange Nacht der Museen [Long Night of Museums]. 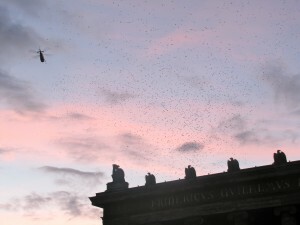 A lone helicopter circled Berlin’s Lustgarten for a half hour, dropping poems on the crowd of thousands. The “Regen der Gedichte” [Poetry Rain] was also a celebration of the bicentennial of Chile’s independence and was accompanied by readings and other festivities. Peaceful “bombings” with literature are becoming a staple of protests. Two years ago, Georgian writer David Turashvili went to the Russian embassy in Tbilisi in the midst of Georgia’s brief war with Russia, and “bombed” the embassy with paper airplanes made out of pages torn from Russian books from his library. You can read his account of it here. DISCUSS: Do Publishing Stunts Sell Books?